Last week I harvested some of my grapes and decided to make jelly. My aunt and uncle were visiting, so I brought the grapes and supplies with me when I went to my parents’ house. 10 pounds of sweet Concord grapes. Seeing that it would take me hours to pluck them off the stems, my aunt and grandmother sat down to help me. It was pleasant. The satisfaction of mindless work keeping your fingers busy. The camaraderie of female relatives sharing in traditional female work. Much like I imagine my great-grandmother worked on the farm: shelling beans or peeling potatoes. One can easily romanticize a simpler time, neglecting to acknowledge the difficulty of this kind of work done day in and day out. That in some societies women were not allowed to own property or have lives outside of family. Instead, I think we react to the hectic nature of modern life and create a fantasy. Leisurely pace, the warmth of family next door, the joy of being home with the children. You forget that being home involves changing diapers every 20 minutes because your son hates to be wet, or not being able to eat a warm meal because he started crying as soon as you completed fixing it. That having your family live next door comes with its own complications. You sit at your desk, daydreaming instead of working on that deadline, imagining a simpler time without architectural computer models. Without a website, blog, Linked In, or Twitter to manage. When you didn’t have to worry about GMOs in your food or carcinogenic flame retardants in your couch. When you didn’t have to worry about being judged for wanting to work part-time or be a stay at home mom because, well, stay at home mom was your only option. In reality I enjoy being able to determine my own future. I like voting, having a career, being taken seriously, having a women doctors, and higher education. My great-grandmother did not have such luxuries when she was a young woman. I enjoyed the chit-chat and the satisfaction from laboring over a good jam. I got into canning this summer. 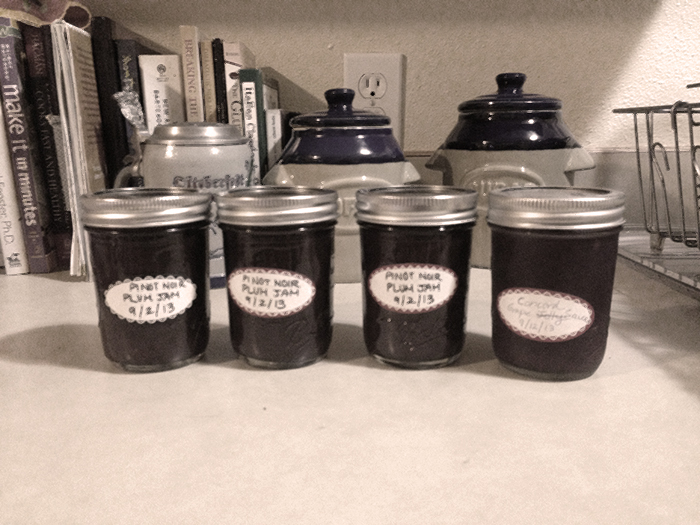 I’ve made Pinot Noir plum jam from two different kinds of plums and grape jelly- er sauce. That batch didn’t gel. This week I walked to the farmer’s market and bought some peaches and apples, with visions of peach jam and applesauce in my mind. Thoughts of feeding my son his first taste of apple, without preservatives or sugar. I’ve also enjoyed being home all summer with my son. Turns out I live in the perfect time. I can have it all. I took a canning class a few years ago, and it’s one of my favorite hobbies, something my husband and I can do together. It is the perfect time to pick and choose our own path to domestic bliss, indeed. Thanks for “preserving” the feeling! I agree, in this age we can have it all. I can enjoy writing a blog post one moment, and playing cards with my family and my aunt and uncle with apple cider and popcorn the next. For the past 25 years I have lived in an apartment, but now I’m in a house with a yard. I’m already looking forward to a tomato patch next summer, and while I romanticize it and forget about all the hard work, those tomatoes are going to taste mighty nice. Love the post and love the picture! I loved reading about women engaging in work together and the idea of making jam sounds fabulous.. a way to slow down time and make something creative and yummy.